Artist/Author: Harris, S. and D. W. Yalden, editors. 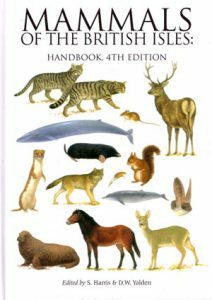 Definitive handbook for the study of British mammals. The text covers appearance, distribution, ecology and behaviour of all land and sea mammals, a history of the mammal fauna, habitats and their mammalian communities, extinct and introduced species, and mammals and the law.